Some clouds this morning will give way to generally sunny skies for the afternoon. High near 80F. Winds S at 5 to 10 mph..
Silver Lake — Police today released a video of the BMW that was involved in a hit-and-run crash with a motorized scooter earlier this week, injuring two men, one of whom is now in a coma. The crash happened at about 8:55 p.m. on Tuesday, Sept. 4 near the intersection of Glendale Boulevard and Waverly Drive when two men on a motorized scooter were struck from behind by the car, police said. The driver of the gray 2010 BMW 5 Series failed to stop, identify themselves or assist the victims, police said. The driver was described as a male, with a beard, dark features, heavy set between 35-40 years of age. There was a female seated in the front passenger seat. Detectives are trying to determine if there are additional witnesses with cell phone video or any information that will identify and assist with locating the suspected driver of the BMW. Bystanders called for paramedics and the passengers were transported to a hospital. A 35-year-old victim is currently is on life support in a coma, said Detective Moses Castillo with the LAPD Central Traffic Division. The other scooter rider, described as a man in his 50s, has been treated and released from the hospital. 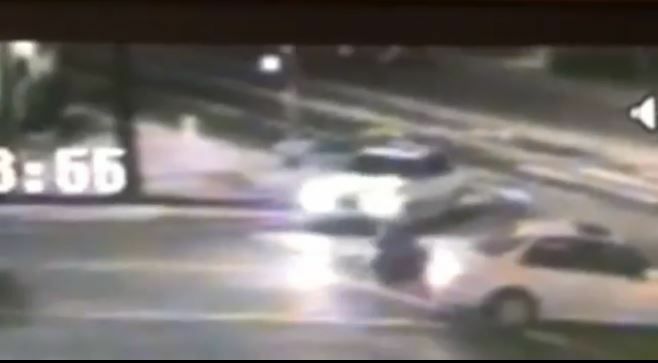 A surveillance video released by police shows the suspect’s vehicle at the corner of Glendale and and Rowena Avenue near the crash scene. The vehicle stopped and went into reverse to dislodge the bike caught under the vehicle, Castillo said. The vehicle then drove forward and turned westbound on Glendale. Anyone with information about this collision is asked to contact Central Traffic Division, Detective Moses Castillo at (213) 833-3713 and or email at 30215@lapd.online. During non-business hours or on weekends, calls should be directed to 1-877-LAPD-24-7 (877-527-3247). Anyone wishing to remain anonymous should call the LA Regional Crime Stoppers at 1-800-222-TIPS (800-222-8477) or go directly to www.lacrimestoppers.org. A reward of up to $25,000 is available to community members who provide information leading to the offender’s identification, apprehension, and conviction or resolution through a civil compromise. Update on Sept. 11: 35-year-old Esdras Velazquez died from his injuries nearly a week after the crash.